What is your expected score? Might be the video card. 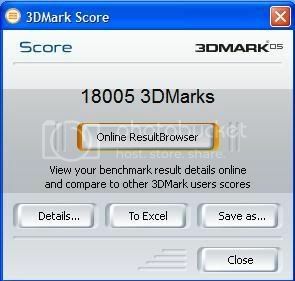 that's a normal score for a rig that uses a 9600GT. 11k+ on a 9600gt and you're still asking for more? lolz! if you want more then you gotta go for higher overclocks and volt-mods. imo, those are pretty decent scores for a 9600gt. Oks na yang score mo. If you want to go more, OC the proc some more (Q6600s are stable sa 3.6-3.7ish on air) and OC the VC. Research ka kung about sa pag voltmod ng 9600gt mo if ever you want to go further. Kano ba yung evga 9600? sana kumuha ka na lang ng 4870 or 4850.. mukhang kasya naman if you went to buy a cheapo casing first and add the budget instead sa vc. lolz! 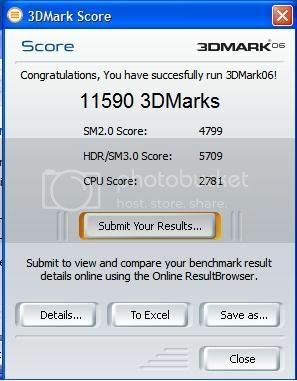 baka akala 3dmark03.. hehehehe! eh ung 9600gt nakuha ko ng $150 lang, sale. stock 2.13GHz xeon with stock 9600GT. umm i have a question, can my board support SLI? oh thank you for your reply, so ganito nlng bibili ako ng 4870x2 next time then bibilhan ko ng isa pa para i crossfire, kakayanin kaya ng system ko yon? Siguro upgrade sa psu, 4870X2 consumes almost 450W on load. so imaginine mo 2 4870X2. 900W, more or less kailangan mo ng mga 1200W. And definitely gagamit ka ng aftermarket cooling on your rig dahil lakas sa init ng mga to.